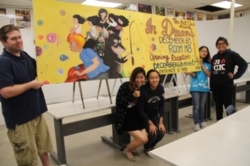 Four teachers worked together to provide a Rowland High School Arts Showcase on Dec. 6. “All types of artwork will be on display, from traditional painting on canvas, pencil and pen drawing, digital art, and photography. We will also feature sculpture and 3-D artwork,” said Angeli Caringal, student curator of the art exhibit and president of the Rowland High School Art Club that has more than 30 members who will be featured in this first time event for the school. “I think visitors will be impressed with the high level and variety of artwork that will be on display. We are going to make a foot path so the public can visit the art and photography show before performances or during intermissions of Comedy Sportz and the Holiday Follies,” said Stephen Faller, who is the new Art Teacher. Rowland Unified Superintendent Ruben Frutos greets revolutionary students from Mr. Luna’s class. Dressed in costumes and placed in competitive teams, Jellick 5th graders took a history field trip at their school and experienced the American Revolution in a fun, hands-on way! 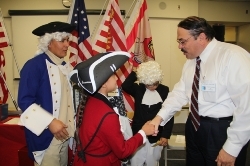 The Walk Through the American Revolution presentation was a 2 ½ hour presentation with dramatic activities and games where students became historical figures such as Thomas Jefferson and Ben Franklin and walked through key points during that time. Teachers Mrs. Darrow and Mr. Luna worked with the PTA to make this exciting educational program take place!